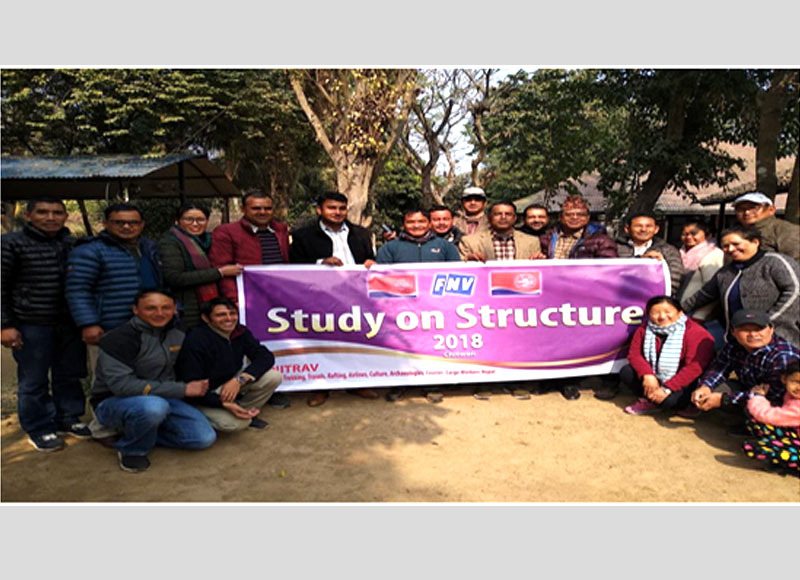 Kathmandu, GEFONT affiliate, Union of Trekking Travels, Rafting and Airlines Workers - Nepal has concluded the meeting on the study on the structure on 12 January 2019 in Chitwan. Chief guest GEFONT Secteraty General Cde. Janak Chaudhari informed about the responsibility of the union members & basics information of the organization. He further highlighted on Government, employer & Union province to central level Structures, he also informed about sectoral employers detail of the UNITRAV. On the occasion, General Secretary Cde. Chaudhari said “In the tourism sector TAAN & HAN are the employers & workers should identify the employers as per there working sectors. He also briefed on judicial process & said " Eight separate law & regulations can be made according to different sectors of the UNITRAV". He also instructed the OSH policy should be made as per the workplace nature & should increase membership by identifying the archaeological & cultural sectors. In the meeting, UNITRAV President Cde. Suman Prasad Parajuli said “The leaders and representatives have responsibilities to share the skills and knowledge learned from the meeting among the members in their respective workplace. He further informed that union will organize such kind of trainings for the member in coming days also.